This episode was produced, directed and engineered by Eric Busby. 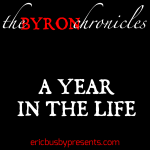 on The Byron Chronicles – Chaos Faction: Episode 4Hyped by one measure to listen to this! on The Byron Chronicles – Chaos Faction: Episode 4Yes! Haven't listened to it yet, just excited!